The Trumansburg Conservatory of Fine Arts (TCFA) is excited and pleased to present Rebecca Lomnicky, winner of the world’s most prestigious Scottish fiddle competition, in concert with David Brewer, a multi-instrumentalist who specializes in Celtic music on guitar, Irish penny whistle, bodhran frame-drum and the Scottish bagpipes. 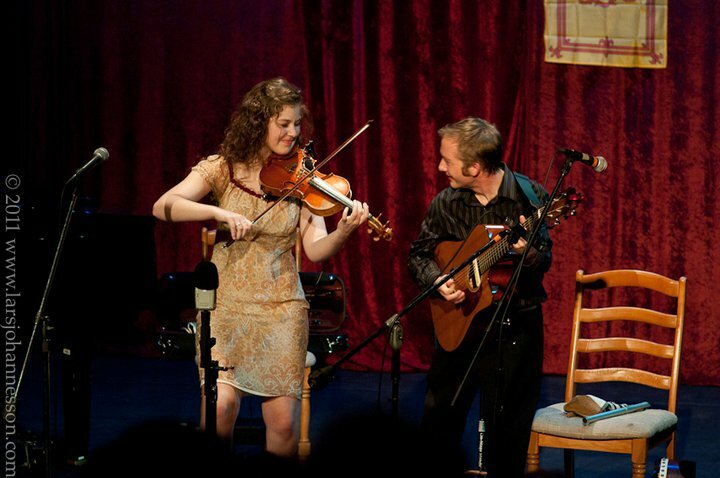 The duo will bring their energetic, emotional music to the conservatory on Saturday, March 15, at 7:30pm. Buy tickets here. Rebecca, who began classical violin and piano as a five-year-old, won the 20th Annual Glenfiddich International Scottish Fiddle Championship—an invitation-only event, regarded as the Grammys of the fiddling world—in 2009. David Brewer has played and toured with Scottish super-group, The Old Blind Dogs, and also with Molly’s Revenge, in the U.S., the U.K., Canada, China and Australia, and played as a special guest of the renowned Chieftains. Together and separately, they’ve performed all over the world. The pair’s blended performances, aimed at bridging the gap between Scottish fiddle and bagpipe music, are stirring and lively, ranging from toe-tapping dance tunes to soaring majestic airs, with wide appeal to diverse audiences. Tickets are available online and will be sold at Good To Go in Trumansburg. To find out more about Rebecca and about David, click on their names to visit their web sites.